The economic crisis has impacted everyone and everything this past year…and your Scope hosts are no exception to the rule. To earn some extra scratch, we’ve decided to venture into the one and only industry that seems to be making money: Disney Teenie-Bopper bands. As far as we’re concerned, The Jonas Brothers have nothing on our new gig. Anyway, we all hope you have a terrific holiday (whatever it is you celebrate!) Enjoy your family, friends, and anything else that brings you joy during these tough times. Hopefully 2009 will be a year of rebirth and growth for all of us. One final thing: thanks to everyone who has tuned into even one episode of The Scope. From our longtime listeners to all of you newbies that just jumped on the ship…we truly appreciate you giving us the time of day. While we love doing the show, it makes it even better to have people that come along for the ride. Please keep listening, commenting, and complaining about what we do. Because we’d do the same for you. Optimus Prime hates The Scope. In a continuing effort to bring new listeners up to speed on the history of The Scope, we bring you another batch of recommended (?!?!) classic shows. This time, we cover the saga that was the lead-up, release, and fallout of Michael Bay’s epic film, Transformers. In itself, this doesn’t seem like a big deal. But when you throw frequent Scope guest, Earl, into the mix, things get hairy (in more ways than one) real quick. Take a listen to our 2006 Year in Review show to kick things off. Then dig in as Earl and a few other guests stop by for THE MOST VOLATILE NERD ROUND TABLE EVER. It’s the only podcast ever recorded that allows listeners to actually see anger emitting from their headphones or speakers. We joke about it ruining friendships. But maybe we shouldn’t. From there, check out our first ever instant movie review (of Transformers, natch!) Our Scope posse drove directly from the theater and to The Scope Studios to break down Michael Bay’s masterpiece. Overall, some of the most compelling Scope episodes ever. At least until Transformers 2 and G.I. Joe open this summer….right? RIGHT?!?! Oh, we almost forgot. Here’s a bonus link to some of Earl’s Spielberg/Bay thrashing. Are you new to the show? Do you love our radio voices? Well, you’re in luck, virgin listener(s)! We here at The Scope know it’s really hard to go back and listen to every single episode just to absorb the six or seven hundred fantastic comedic moments scattered throughout. So, for your podcasting convenience, here are a couple of show suggestions that just might float your boat. Check out episodes 6 and 25 and a Scopeclusive game: “Hit the Post!” If you’ve ever wanted to listen to us sound like Rick Dees or a member of a Morning Zoo, these are the shows for you. And luckily, Adam doesn’t ruin any of it by participating. This should hold you newbies over until the next batch of suggestions. Thanks for supporting The Scope and keep on listening! Where are your new Scope shows? Get off our backs! It’s summer and all we want to do is pour ourselves a freshly-squeezed glass of lemonade (or Country Time, if we’re lazy), belly up to the old swimmin’ hole, and let the smoldering sun leather up our Speedo-clad bodies. 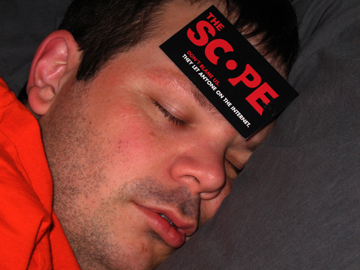 What that means to you, the loyal Scope listener, is that you won’t get another new show until early next week. 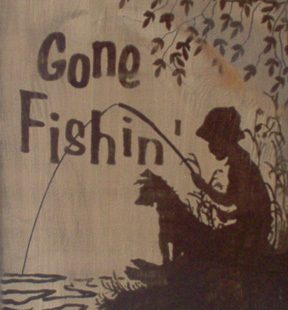 But we promise we’ll be back with tales of vacation, action figure hunts, and New Kids on the Block. Until then, enjoy your summer…we’ll be talking at you before you know it. It’s been a busy three weeks for your Scope hosts. Adam has been toiling away at his new job, Jared has been busily preparing for and performing at MarsCON 2008, and Shane has beaten one full level of Call of Duty 4. So all in, all, a lot has been accomplished. That being said, we’ve got some unfinished business to cover as well as disseminate a little bit of Scope news. Let’s begin. Even without picking any of the female acting categories, frequent contributor to the show, Molly, picked five of seven categories correctly. Congratulations, Molly! You truly are the entertainment expert..for 2007. …it never happened. While we had big plans to make a big splash at the convention, we failed to follow through. To quote Marsha Brady, “Something suddenly came up.” And that something involved whisky drinks, lager drinks, vodka drinks, and cider drinks. We promise we’ll cover the MarsCON comings and goings in the next Scope episode! When will we record and post it? We plan on heading back into the Scope subterranean studios to record a show that will be available March 17th! But until then, check out an older show, visit the brand new Possible Oscar site, and flood us with comments and questions! You know you want to. The Scope wishes everyone a Merry Christmas (or whatever the hell you celebrate)! 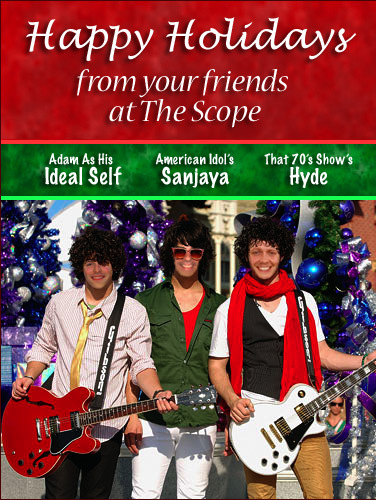 Your Scope Crew hopes every single Scope listener (all six of you) has a happy, healthy, and safe holiday season. Whether it is Christmas, Hanukkah, or some other event that floats your boat, please enjoy it. And continue to listen to our podcast. And, as motivating factor to keep tuning in, here’s our holiday portrait. You can’t imagine how hard it was to get these four egomaniacs (especially Earl – and how did he get in there, anyway?!?!) to dress up, catch a little of the holiday spirit, and take this delightful photo. The Scope Puts Its Mark on CONvergence. Again. Once again — although in a much more subdued capacity — your Scope hosts (sans Adam, because heâ€™s far too good for costumes, Dr. Who, and the combined smell of B.O. and nacho cheese sauce) crashed the festival known as CONvergence. 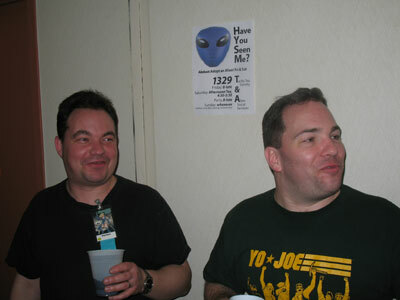 For those of you that donâ€™t remember, CONvergence is the largest sci-fi and fantasy convention in Minnesota. Itâ€™s quite a big to-do in the world of Midwestern geekdom, so we were happy to attend. To make things even more interesting, Jaredâ€™s band, Possible Oscar, performed a great set and had an equally great response. Along with semi-frequent Scope guest, John, Jared played a number of songs found on his album, The Wrath of Con, and premiered a new parody based on a U2 classic. Look for it on The FuMP July 13. CONvergence wasnâ€™t all business, however. There were obnoxious amounts of liquor (see picture of our good friend, Mike and his run-in with Scope marketing), Stormtrooper costumes, and G.I. Joe chest hair (thanks, Earl!… Thearl). And it is all documented in a sweet collection of photos. Take a look, and weâ€™ll talk more about our nutty CONvergence experiences on the next episode of The Scope. The second VH1 World Series of Pop Culture began this week. Color us surprised that a tiebreaker question between teams “The White Russians” and “Remo-Leen-Teen-Teen” was one we used on last year’s Scope World Series of Pop Culture. The tiebreaker question: Steven Spielberg movies. It really is a case of life imitating art. At any rate, tune into VH1’s spectacle this week (it really is a fun show for all of you pop culture nerds out there) and be warned: The second edition of The Scope World Series of Pop Culture will return this fall. Feel free to email us at The Scope if you are interested in competing AND if you’ve got some serious pop culture knowledge. Finally, the picture you’ve all be waiting for, German Earl vs. American Earl. Hey everybody, it’s your Scoperfriends here, just letting you all know that we made it through the Midwest’s biggest Science Fiction convention without serious physical injuries…but the mental side is another story. We here at The Scope, with the help from old friends and new, did our very best to cover all of the activity at CONvergence in our own special way. Yes, we have crazy stories to tell. Yes, we recorded a show. No, it’s not ready yet. And yes, we’re working hard to bring the results to you in the next episode of The Scope…and beyond. When will it be ready? Well, that’s to be determined. But when it is ready, it will be awesome. Oh yeah! Finally, before we sign off, we want to extend a hearty “Thanks!” to all the people that helped out and supported the show this weekend. You’ll get your individual props…just not now.